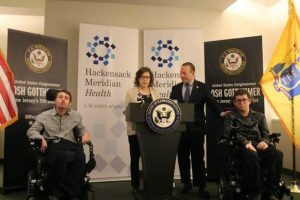 U.S. Rep. Josh Gottheimer, D-5th District, announced that Annette Leo will be his guest at the State of the Union Address on Tuesday night in Washington, D.C.
Leo, a Closter resident is the mother of two who have been diagnosed with Ataxia Telangiectasia (A-T), a rare, progressive neurological disorder that affects about 600 people in the United States. Gottheimer also announced his plan to introduce bipartisan legislation to restore the Orphan Disease Tax Credit in full and ensure that diseases like Sarcoidosis remain counted as rare diseases, so that they will be eligible for the same research opportunities. “Increasing the Orphan Disease Tax Credit is key to development of treatments for orphan diseases because it allows the researchers to maintain the capital necessary to complete their research and bring a treatment to market. Our legislation will restore the Orphan Disease Tax Credit to 50 percent of clinical testing expenses to give these rare disease treatments an even better shot at reaching the patients who so desperately need them,” said Gottheimer in a statement. “We must keep investing in the best scientists in the world that are right here in America. It is time to invest in innovation in medicine and take a chance on big ideas. It is time to invest in caretakers and support networks that are not heroes by virtue of their birth, but by virtue of their remarkable love and tirelessly work for the ones they love. It’s time to invest in hope.” Gottheimer said. The new legislation, if passed, would restore the Orphan Disease Tax Credit that was cut in half by the federal tax bill in 2017.